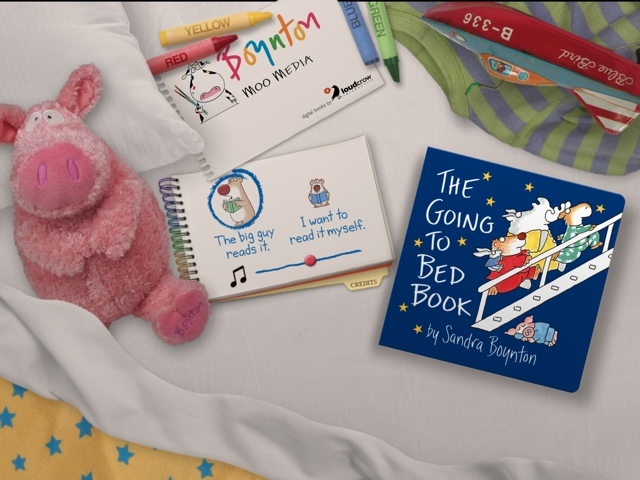 Sandra Boynton has been a goddess in the Pop Culture Family home. Little Diva had The Going To Bed Book memorized before she was two. Super Girl learned some of her animal sounds from Moo Baa La La La. There are few things she likes better than watching all the Hippos Go Beserk! At some point, I had a Boynton Mom's Family Desk Planner. And who doesn't love a BEE-BO (a tiny hippo's way of saying "Belly Button" [Book]) or a good Barnyard Dance? We are truly the house that Boynton built. That being said... I'm afraid I've ruined my child. 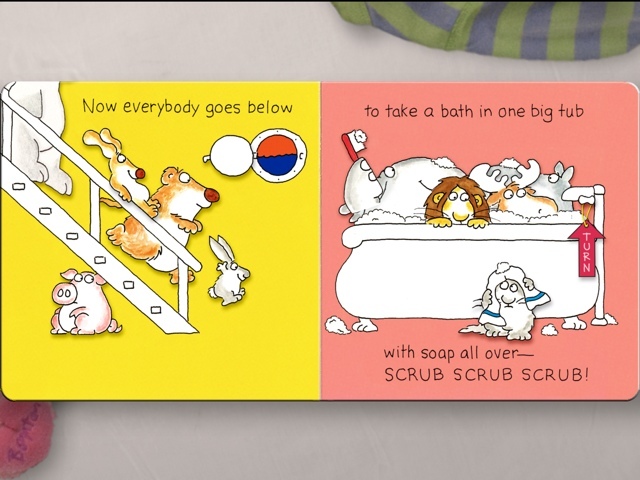 The Going to Bed Book is a staple in the Pop Culture household. When Little Diva was approximately the same age Super Girl is now, we had read the book so many times that she had the book memorized, page by page, line by line. I had hoped for the same thing for Super Girl. But I took a wrong turn at some point... I downloaded the interactive app. Let me say, I stalked this app until it finally came out. Really, all I had hoped for was a version of the book that could read itself, like the version Pop Culture Dad has on his Nook Color; but what we ended up with is so much more. So much better. Every single page is interactive, and every time we open the interactive book, we discover a new feature we hadn't seen before. The pages are generally the same, minus some subtle differences. This is the same page in the app. Notice they are identical except the faucet. On the left page of the app, you can open and close the window, and the animals move on the stairs. They also make sounds. 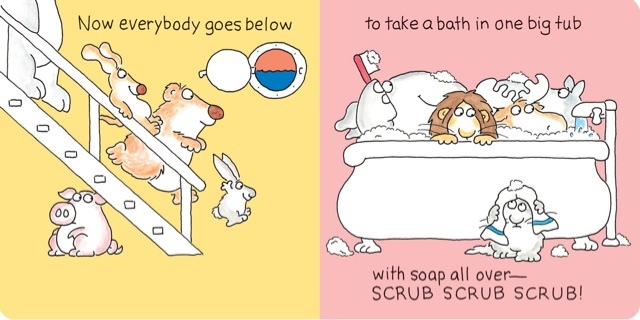 On the right side, the animals soap up. You can also turn the faucet on and off, and when it is on, bubbles fly out of the tub, which you can pop. This is the page we were reading (in the actual book) last night when I discovered I have messed up my kid. At some point, our board book was (temporarily) lost, which meant all we had was the app. The app then became the norm. And I guess Super Girl is also still too young to comprehend the difference between the two things. Or at least I'm guessing that's the problem... because last night... while reading the book… Super Girl tried to move the animals down the stairs. And close the window. And turn on the faucet. And scrub the elephant. In. The. Book. I laughed at first, because the whole thing was really cute. But the poor girl was confused and frustrated. She threw up her hands and declared (over and over), "It not working!!!". I guess I really should have thought this through better. Once you go app, you never go back.